Several days ago the Baron posted an amusingly-captioned photo sent to him by an old and dear friend. As he writes, ceaselessly, Sister Benignus is correcting papers at her desk while she waits for him to finish. The late afternoon sunshine slants through the windows uncomfortably warm on Zarqawi’s back, since his time is to be spent in late summer, when all the other students are out of school for the holidays. He is on #200,352 and he despairs of ever finishing. The blackboard stretches beyond his horizon. Z’s shirt is covered with chalk, as are his hands and hair. He would give his soul for a falafel sandwich, but unfortunately, he remembers he already sold that particular article years ago for a mess of jihad pottage. In eons beyond measure, his soul will melt from this exercise and it is then that he will be permitted to beg forgiveness of his victims. Funny thing is, by the time he is done with his purgatorial task, he will really, really mean his words of contrition. The mills of God grind slowly… and Sister Benignus is one of His millers. 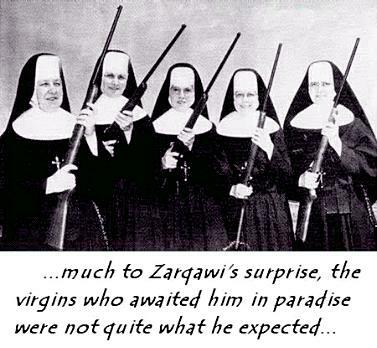 So just in case you wondered, Sister Benignus has Zarqawi now. It is a much worse fate than whatever it is you might have imagined for him. Even Lucifer steers clear of Sister Benignus. And Saint Dynphna (the original) sneaks Z cookies and milk when Sister Benignus pretends to not be looking. Some where around 900 million lines Z will realize justice is served but there is no limit to God’s mercy.